12-inch FRP-Derakane 411, Fig. 7014 Scrubber Separator System with single Nexus veil, spray nozzle assembly constructed of PTFE. The Fig. 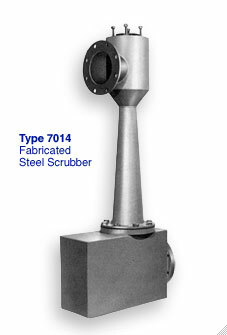 7014 Scrubber Separator System is a complete, single-stage scrubbing system combining a Fig. 7010 Ejector Venturi Gas Scrubber and a Fig. 7040 Separator. 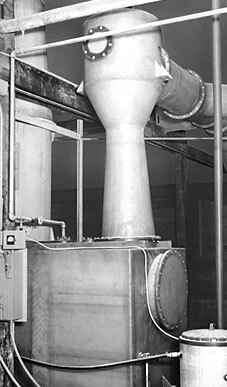 This air pollution control scrubber system utilizes the ejector-venturi principle to entrain and scrub large volumes of gas containing fumes, vapors, noxious gases, dusts, odors or particulates, and vent clean, dry gas to the atmosphere. The Fig. 7014 Scrubber Separator System is capable of providing efficiencies as high as 99% or more in a single stage system and higher in a multi-stage configuration. Gas handling capacities range from 25 CFM for a 3" scrubber to over 2000 CFM for a 12" scrubber. The compactness and design simplicity of the Fig. 7014 Scrubber Separator System permits installation in difficult to reach areas. Fig. 7014 Scrubber Separator System offers the following competitive advantages: low initial cost, low energy requirements, simple design with no moving parts which means low maintenance, continuous operation (as opposed to bag houses and precipitators), no electrical requirements, simultaneous gas absorption and particulate scrubbing. Fig. 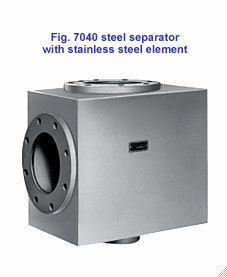 7014 Scrubber Separator Systems most often operate with a pressure rise or draft. 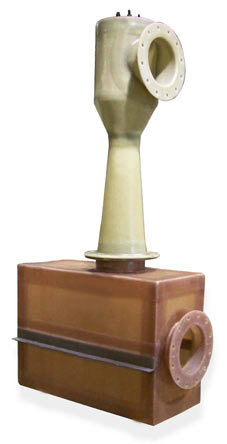 This serves a dual purpose: to boost the pressure of the gas and to clean the gas at the same time. As part of a multi unit system in removing sulphur monochloride. Used to remove HCl fumes during tank venting. First stage in an ammonia scrubbing/recovery system. For more detailed information about Scrubber Separator System, Bulletin 7S and Bulletin 7S Supp. Literature. To submit a Request for Quote (RFQ) for Scrubber Separator System, Adobe PDF or submit an online interactive RFQ Form for Scrubbers.